Earlier this week we looked at recent statistics on 401(k) loan activity from the Employee Benefit Research Institute (EBRI) and the Investment Company Institute (ICI). Several other findings from this same study helped show just how important these retirement savings vehicles have become over the past few years. 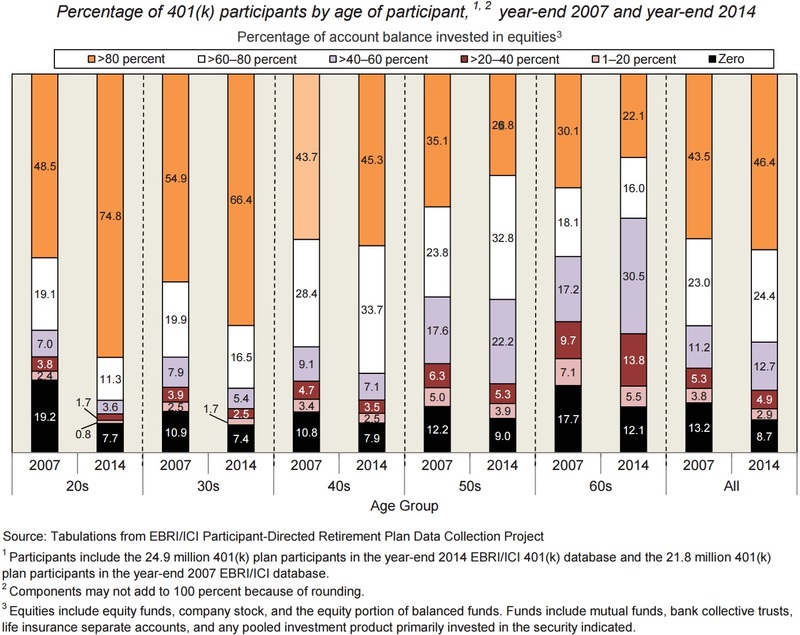 For example, there were 24.9 million Americans in 2014 (most recent data available) participating in the 81,139 401(k) plans that the EBRI/ICI researchers examined. The average (median) account balance for these participants was $76,293 ($18,127), and together they controlled nearly $1.9 trillion in assets. 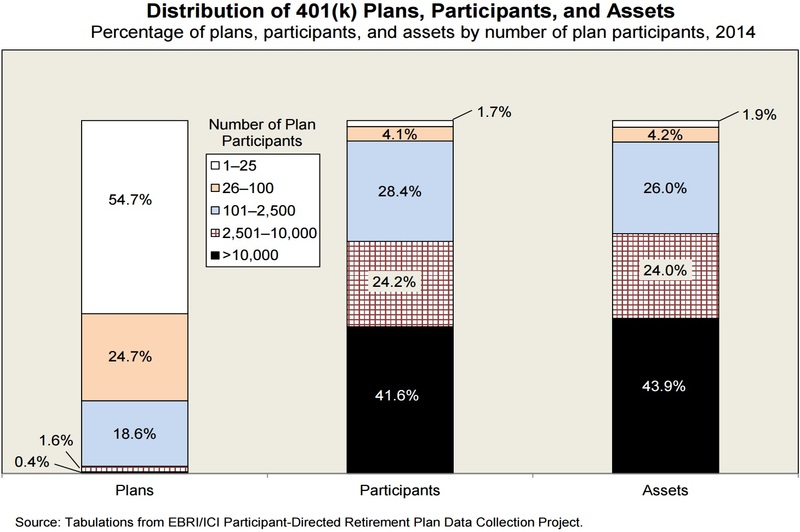 Small 401(k) plans with 1-25 participants accounted for more than half (54.7 percent) of all the plans in the sample but they held only 1.9 percent of the total assets. Unsurprisingly, a majority (53 percent) of the 401(k) participants with account balances of less than $10,000 were young adults in their 20s or 30s, and most (60 percent) participants with account balances greater than $100,000 were in their 50s or 60s. 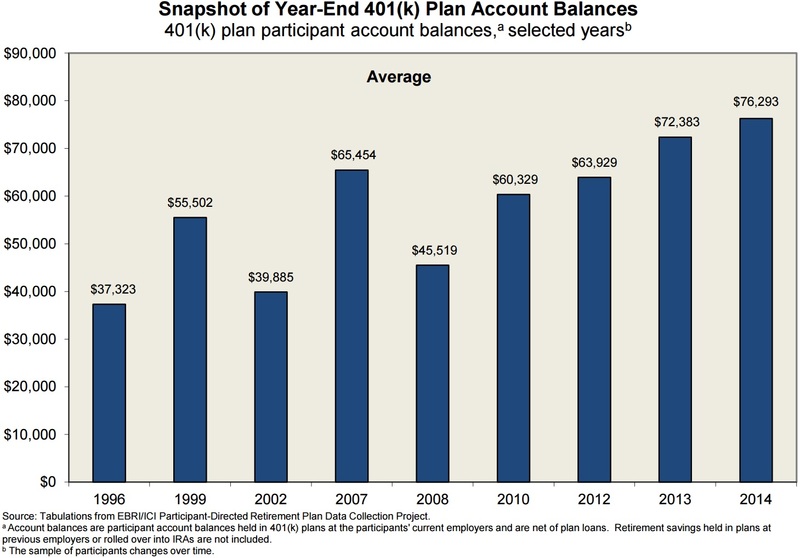 At year-end 2014, 43 percent of 401(k) plan participants’ account balances were invested in equity funds, on average, a marked increase from 37 percent in 2008 but still below the pre-recession high of 48 percent. Equity allocations also appeared to be better aligned with participants’ nearness to retirement (see above chart), something that was likely helped by growth in both availability and utilization of target-date funds (TDFs). A related poll conducted by Gallup found that a resounding 91 percent of surveyed plan participants are currently satisfied with their 401(k) as a tool for saving for retirement. Forty-four percent of respondents described themselves as being “very satisfied” with their 401(k) plan, and 58 percent said that they use a professional financial advisor to help decide how to allocate their 401(k) investments.